A Miami Beach woman was named a finalist for a prestigious White House Fellowship for her work helping foster kids further their education. Click here for story on Miami Herald. Virginia Emmons of Miami Beach served in the Peace Corps, started a school in Africa and has helped jump start two nonprofit organizations in Miami-Dade County. It is no wonder why this 36-year-old was chosen as a finalist for one of the most prestigious fellowships in the country. Emmons, the youngest of eight children, was selected as one of 30 national finalists for the White House Fellows class of 2012-2013. Although she didn’t make the final cut, she said she was thrilled to have been considered a contender. The White House Fellows program was started in 1964 under President Lyndon B. Johnson. The purpose of the program is “to provide gifted and highly motivated young Americans with some first-hand experience in the process of governing the Nation and a sense of personal involvement in the leadership of society,” according to the White House website. Finalists are chosen from varied professions including, law, medicine, business, journalism, local government and the armed services. Once they are selected, they are interviewed in the nation’s capital over a nearly three-day period. Of the 30 finalists, between 11 and 19 of them are chosen to proceed to the fellowship where they work as full-time, paid assistants to senior White House staff, the vice president and cabinet secretaries. When the 2012-2013 fellows were announced, Emmons’ name was not on the roster. But with two organizations to run, plus a 1-year-old daughter and a new baby on the way she is not disappointed. Emmons successful career as an activist started in her hometown of Greendale, Wisconsin. She attended college at the University of Wisconsin at Fayetteville, and earned a bachelor’s in international relations. She then went on to volunteer with the Peace Corps in Niger, Africa. What really concerned Emmons about the village she was working in was the lack of education. She and her sisters, Melanie Damian, Mary Dhanji and Melissa McCarthy started an elementary school in the village of Kabey Fo in Niger. Emmons returned to the country and moved to Miami with her husband, Brett McNaught, whom she met while in Africa. She soon found a way to help children locally as well. Emmons sister, Melanie Damon, was an attorney in Miami representing underprivileged kids in court pro bono. She voiced her concerns to Emmons. In 2002, the Road to Independence scholarship was started and stated that any child who is in foster care on their 18th birthday can have access to free tuition to any state public school. When Emmons heard this, she and her sisters started to shape the idea for her first nonprofit organization, Educate Tomorrow. The purpose of Educate Tomorrow, officially founded in 2003, is to provide mentors for children in foster care who want to attend college. The mentors help with finding housing, jobs and other basic needs for entering a university. Typically, volunteers are at least 25 years old and good role models or professionals in the community. The organization also holds workshops such one that helps students apply and qualify for financial aid. The organization also holds fundraisers throughout the year to support the elementary school in Niger and has since added an Adult Literacy Program to the village. They are now in the process of adding a dormitory which will provide room and board for the student at the new secondary school. But Emmons work to improve education didn’t stop there. After being the CEO of Educate tomorrow from 2003-2010, Emmons stepped down and her husband took over. She hopes that the Miami model of helping foster children get educated will eventually spread to the rest of the country. Although being a White House fellow would have helped that goal, she is now focused on her new pursuit: Learning One to One, a foundation aimed at getting children more individualized attention in school. The foundation, expected launch with a pilot program this fall, will work with schools to customize learning plans. Emmons and her team are currently creating an app that would show each student’s learning plan and their daily progress so teachers, parents and administrators could see what each child has learned that day. Emmons said she got the idea after visiting a school in Colombia that had a similar program. 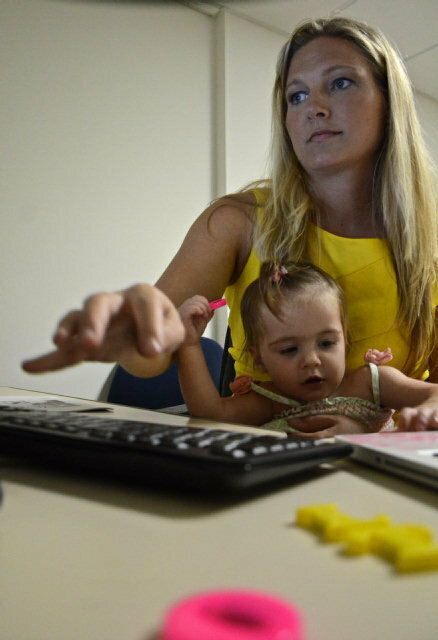 Until the program pilots, the busy mom of 1-year-old Emma will be finishing her graduate degree in community and social change from the University of Miami. She is expected to graduate in August and her new baby is due in October. As for being a White House Fellow, Emmons said everything happens for a reason.